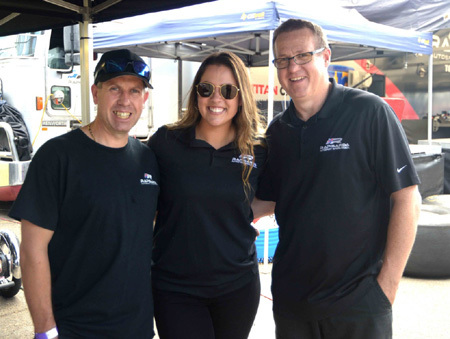 Point's leader, Wayne Newby, will lead the Rapisarda Autosport International charge at the Santo's Summer Thunder meeting at Sydney Dragway this weekend. Newby leads RAI teammate Ashley Sanford, reigning champ Kelly Bettes with Damien Harris in fourth place. "Sydney is our home track and I'm confident that we can rebound from our last meeting at Willowbank Raceway," said Newby. "We raced our new canopy car in the opening round of the season and scored a win. Then at Willowbank, we came home in third place and still retained our place at the top of the point's table. We are still learning how to get the best from the car, for example at Queensland we had some issues with the canopy on the car causing the inside of the cockpit to fog up. Something that you don't want to happen when travelling at 500 km/h or so." Sanford, who turned 25 on January 14, is chasing her first Oz Christmas tree after finishing runner-up at the two opening rounds of the 2019-19 season. "Couldn't think of a better birthday present than to take the win in Sydney," said Sanford. "We've come close both times this season in going down to Wayne in Sydney then Kelly Bettes at Willowbank. I'm being patient and not feeling pressured to get the first win. You only need to look around at some of the guys racing in the NHRA like Clay Millican who had around 254 starts before landing his first win. The message is if you persist then it will happen. I love racing in Sydney. It's the home track for our team owner Santo Rapisarda and there is a great feeling in our pits with lots of Santo's family, friends and work colleagues coming out for the event." "Mechanical woes ruined our chances in Queensland," said Harris. "We had low ET and the top speed in two rounds at Willowbank and came within a whisker of making the final. We have great car speed and a first-class hot weather tune-up ready for the weekend. That will be important with a maximum of 37C expected on race day. A win in Sydney is definitely on the cards."